Well, after months of waiting for this year’s NeoCon, the day finally came and I naturally geeked out with all the design I found within the walls of the Merch. Floors upon floors of designer furniture, materials, artwork and the masses of people from all over the world. 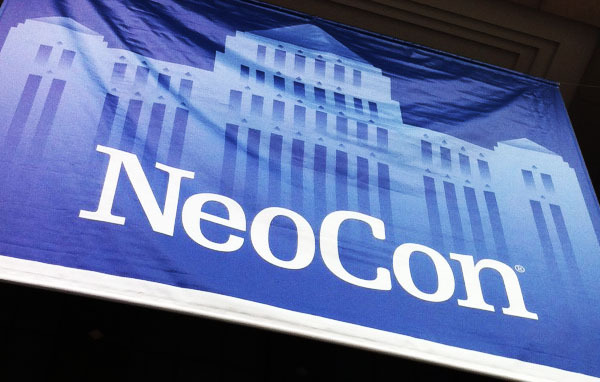 NeoCon is kind of difficult to navigate not only because of the the sheer size of the Merchandise Mart and all the floors, but because of the people. However, that is only secondary to the amazing display of furniture and new designs. NeoCon is truly a designer’s heaven. 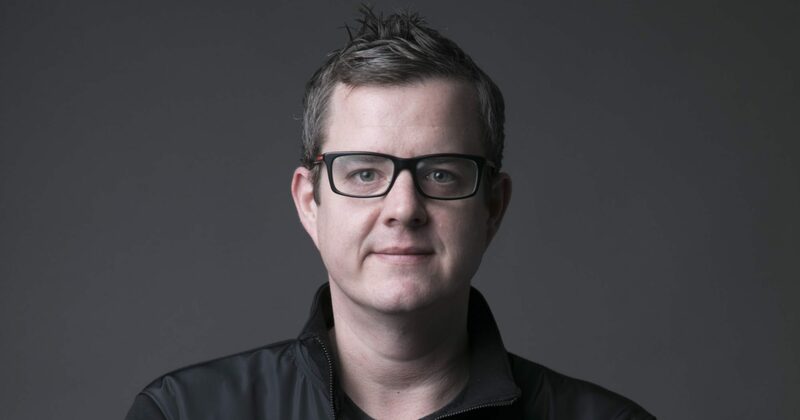 Regardless of your profession; graphic designer, industrial designer, buyer, showroom attendant, painter or photographer, there is something there for everyone. There are literally about 6 floors of exhibition space inside one of the world’s largest buildings. 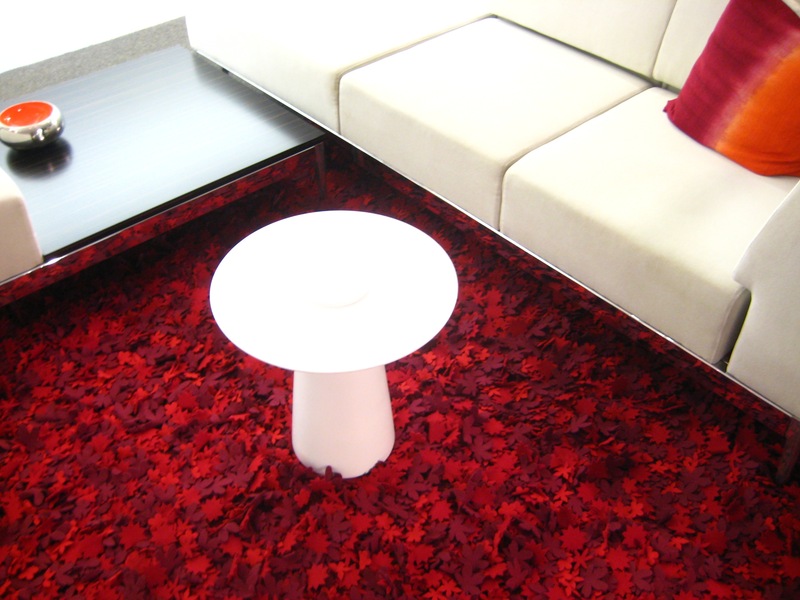 Some floors feature well-respected and established retailers such as Herman Miller, Knoll and KI. Other floors in the show feature some lesser-known retailers from all around the world including Europe, Japan, and South America. Beyond those retailers, you have B2B suppliers that focus on products such as lighting, flooring, veneer, handles, etc. All in all, there is something for everyone at this show and I’m so lucky to have gone this year (especially for free)! Coming out of the show, I realize there are some trends moving from 2013 into 2014 in the industrial design world. There are definitely 5 major trends and one behavior trend I noticed. Felt: This one is huge! I saw this material everywhere in the show. 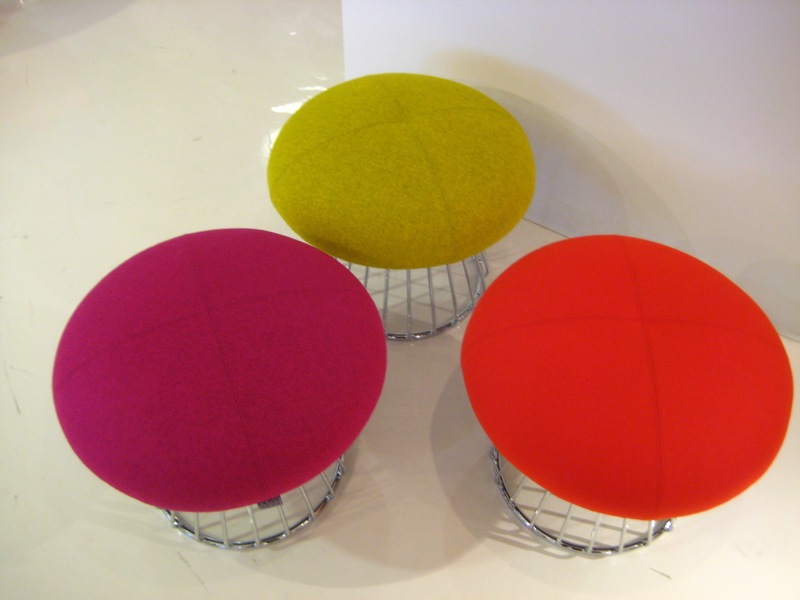 Felt, brightly colored felt, was being used on everything from flooring to chairs to room dividers. Not sure if this is a response to the price of cotton in the world, but either way, manufacturers are putting it to great use in some unconventional areas. Molded Plastic: If your chair is not covered in felt or wool, it most likely will be made of molded plastic or molded wood veneer. 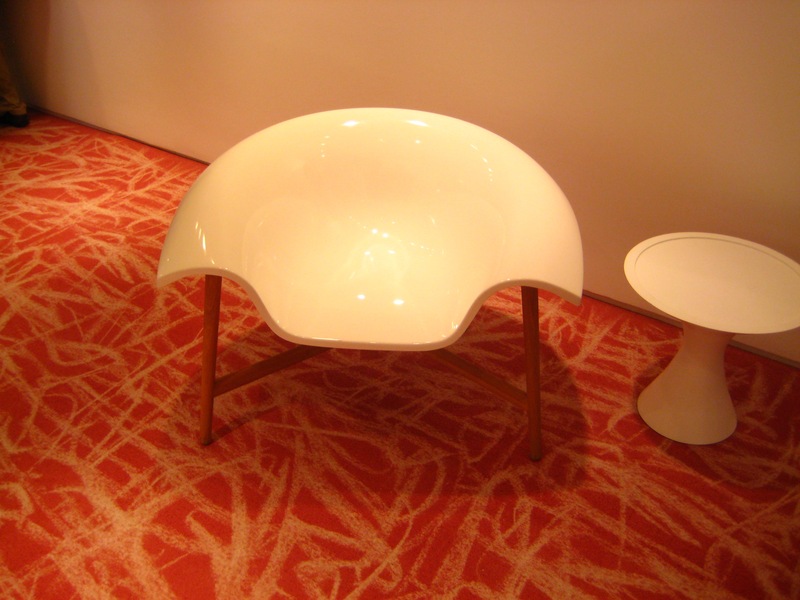 It is so nice to see the come back of molded design, Saarinen and Eames style. If we can start designing furniture like that again, I will be a happy man. High-Back Furniture: I did see a lot of high-back chairs last year at the show, but this year it seems as though everyone has a high-back chair model. Most of the high-back chairs were angled at about a 110º angle. I’m thinking, and this is just my opinion, is that high-back chairs are meant to signal affluence and high-style. If that is the case, then I guess I’m out of style. Call me crazy, but I love lower, horizontal, and rectangular furniture. 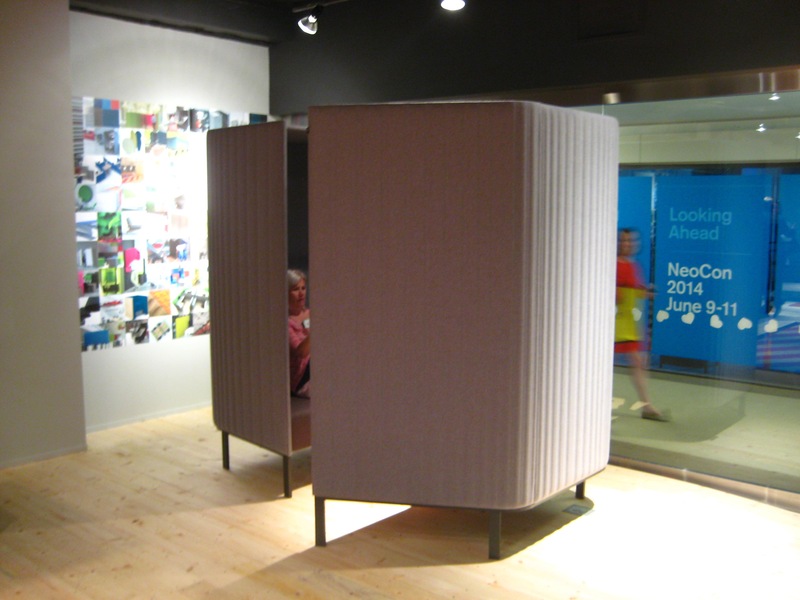 Seclusion/Private Collaborative Work Areas: Again, this trend was big a few years ago at NeoCon and it’s not going away. Most of every retailer had some sort of seclusionary, collaborative workspace (some of them made of felt). It appears that this design is in response to companies who are looking for open-air working areas. Long gone are the days of the cube and the conference room. Bright Colors: I’m not sure if this is just for the show, to gain attention; but most of the retailers had their furniture in bright, almost neon-like colors. I’m sure the brighter the colors, the happier the person using them; but come on, neon-yellow is just way too bright for most people. Just give me the chair in black and I can use it in any environment. People Looking for Alcohol: Granted I did arrive mid-afternoon to the show, but it seemed as though people were on the prowl for alcohol; looking for the next open bar within a retailer environment. Yes, I’ve been to trade shows before, many different kinds; but I have never seen this level of excitement or anticipation for alcohol. I’m sure it was a long day for most people there, but come on people, this is Chicago, we have plenty of bars. 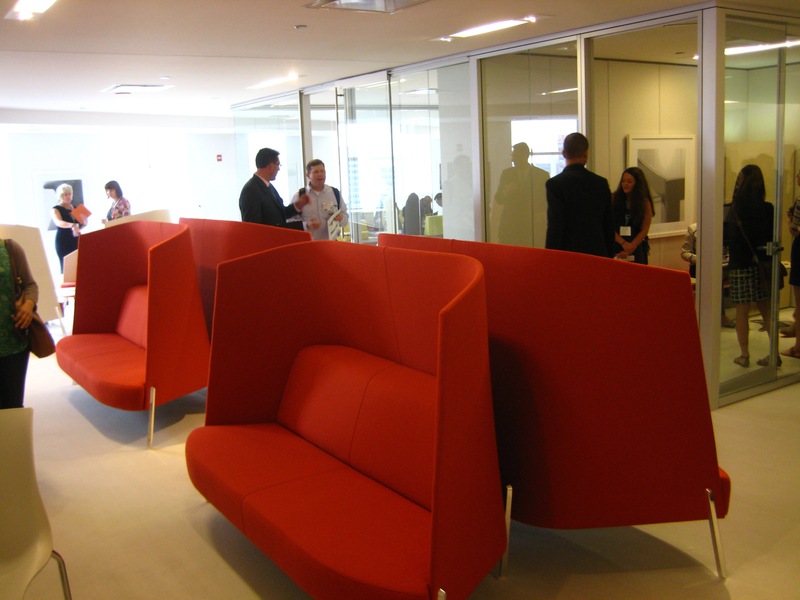 Other Trends: If it’s not organic in design (chairs), it’s very angular – no middle ground. Also, the use of hardened-foam in chairs and benches. I have a feeling that we’ll be seeing a lot more of this in the coming years.